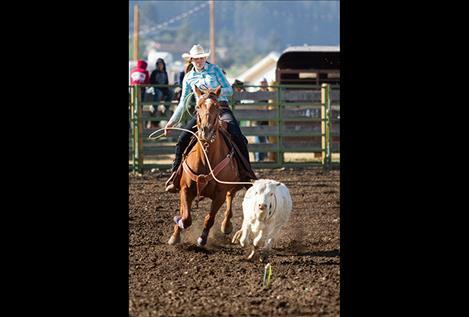 Polson cowgirl Kyla Blixt ropes one. Arlee Scarlets battle at the net during the Spike It Tourney. Polson cowboy Willy Lytton scored a time of 32.34 in the team roping event where cowboys and cowgirls from across Montana gathered at Polson on Sept.16. 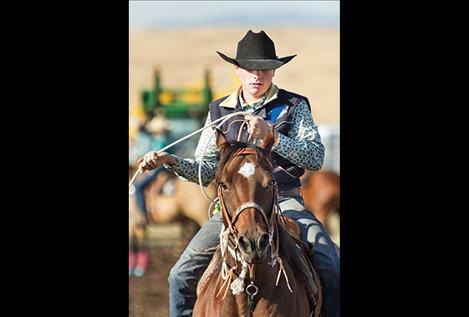 POLSON – High school cowboys and cowgirls from across Montana gathered in Polson Sept. 16, for a one day, two rodeo event. Held at the Polson Fairground, the event was put on by the Mission Valley High School Rodeo Team. Local events included bull riding, barrel racing, team roping, breakaway roping, tie down roping and goat tying. Hailey Weible of Charlo placed fourth in the girls’ all around. Weible placed third and fourth in the goat tying, while taking first in the barrel race in both events with times of 17.8 and 18.14. In the breakaway roping event, Ronan cowgirl Hallie Sohr took second in the first rodeo and scored a time of 3.31 in the second rodeo for first. In the first rodeo, Maggie Lund of Ronan placed fourth in the goat tying and third in the barrels, while Kyla Blixt of Polson took fourth place in breakaway roping. For the cowboys in the second rodeo, Trapper McAllister finished third in the tie down roping. Also in the second rodeo, Willy Lytton of Polson and teammate Taylor Harris of Florence scored a second pace time of 32.34 in the team roping event. ARLEE – The Arlee Scarlets celebrated homecoming weekend by hosting the 14-team Spike It Volleyball Tournament on Saturday. The Scarlets won it all by defeating Clark Fork 25-17, 25-17 in the championship game. Eden Morin had five kills and three aces, Mikayla Rieken added 10 kills along with Syndi Rogers seven assists in the championship game for Arlee. In pool play, Charlo won 6 out 12 matches, Mission won 7 out 12 matches and Arlee won 11 matches out of 12 to set up the championship match up with Clark Fork. COLUMBIA FALLS - Kaelyn Smith had 18 kills to help the visiting Polson Lady Pirates outlast Columbia Falls 21-25, 25-21, 25-16, 16-25, 15-12 on Thursday in a Class A conference matchup. Laurel Bitterman added 22 assists and four aces for the Lady Pirates, who also received 27 digs from Kyler Lundeen. ST. IGNATIUS – Lady Bulldogs River Gonzalez and Azia Umphrey both had a team high ten digs as visiting Loyola topped the Lady Bulldogs 15-25, 11-25, 17-25 on Sept. 19. Frankie Smith, Tristen Adams and Afton Brander all added two aces each and Sophia Tolbert joined in with 15 assists. 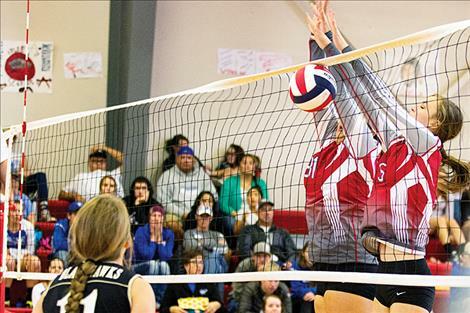 The Lady Bulldogs fell 15-25, 11-25, 17-25 to Deer Lodge in a road game on Thursday. TROY – Troy Mitchell threw four touchdowns and ran a kickoff back 70 yards for another score as the visiting Mission Bulldogs routed Troy 70-22 on Friday night. Gus Bosley rushed for three touchdowns for the Bulldogs. Bosley’s scores came on runs of 26, 17 and 20 yards. ARLEE – The Arlee Warriors rolled to a 36-14 homecoming victory over Plains on Friday evening. Warrior wide receiver Chase Gardner caught two of quarterback Lane Schall’s three touchdown passes. Running back Darshan Bolen ripped off a 60-yard run and Rylan Crawford added a 38-yard blocked punt return for Warrior touchdowns. HAMILTON – The Polson Pirates girls and boys golf teams both finished second on Saturday at the Western A Divisional tournament to earn spot at the State Class A Golf Tournament in Sidney. The tournament starts on Thursday and concludes on Saturday. Carson McDaniel tied for third by carding a 76 followed by teammates Matt Hobbs (77) and Trey Kelley (83). For the Lady Pirates, Cali Cannon finished seventh with a score of 98 followed by Amanda Farley (99) and Berkley Ellis (108). Ronan Maiden Brooklyn Olson tied for sixth place with a 96. Olson is the lone golfer for the Ronan golf team headed to state. HAMILTON – On Saturday, the Ronan boy’s cross-country team finished fourth at the Hamilton Invitational. James Normandeau finished in fifth with a time of 17:48.2 with Nate Dennis and Kiry Detwiler finishing in the top 15 for the Chiefs. Lindsey Brooks finished in sixth place for the Maidens. BIGFORK – Both the Polson boys and girls soccer teams shut-out the hosting Bigfork squads on Sept. 19. Marina Mayorga and Ali Hupka both scored two goals apiece for the Lady Pirates, while Ashlee Howell added a goal of her own and three assists in the 5-0 victory. Polson’s Robin Erickson scored a hat trick and two assists in the 8-0 rout. Mack Moderie had two scores and one assist, while Michael Vergeront had one score and two assists. On Thursday in Columbia Falls, the boys squad handily defeated the Wildcats 3-1 behind scores from Keyan Dalbey, Moderie and Vergeront. Russell Smith had nine goalie saves. For the girl’s squad, Howell scored twice late in the game to knot the score at 5-5. However, in the waning moments of the game, the Wildkats slipped past the Lady Pirates defense to score the final goal winning 6-5. The Pirates added another W in the win column on Saturday as they narrowly defeated visiting Whitefish 2-1. Vergeront and Erickson accounted for Pirates’ scored goals. Unfortunately, for the Lady Pirates, Whitefish scored a late goal to break a 3-3 tie and take the 4-3 win. Ashlee Howell scored two goals for the Lady Pirates.